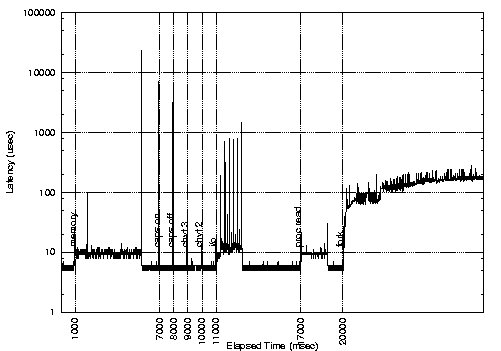 From the first figure, it is possible to see that standard Linux exhibits high latencies at the end of the memory stress (a program that reads and writes a large array in memory), during the I/O stress (a program that reads and writes large amount of data on a file), when accessing the /proc file system, and when switching the caps/lock led. 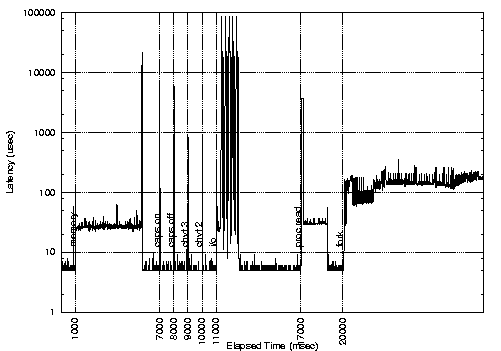 The large latency at the end of the memory stress is due to the munmap() system call. 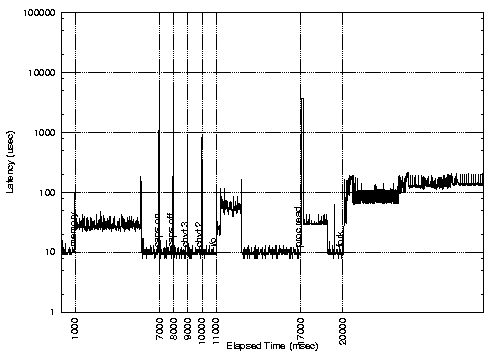 Comparing the figures it is possible to see that the low latency kernel solves all the problems except the /proc file system access and the caps/lock switch. 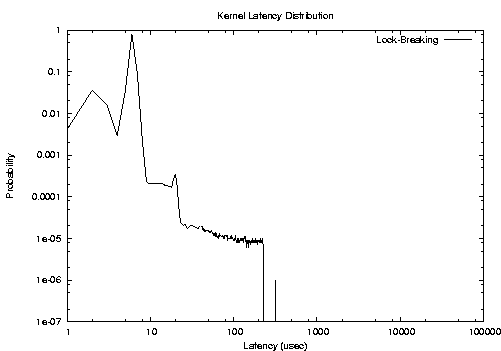 On the other hand, the preemptable kernel eliminates the large latency in the /proc fs access, but does not solve the problem with the memory stress, and is not as effective as the low latency kernel in reducing the latency during the I/O stress. Finally, the lock-breaking preemptable kernel seems to provide good real-time performance, but still has some problem during the I/O stress. 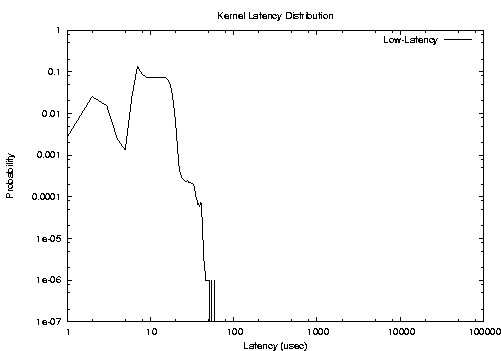 By repeating similar experiments for longer amounts of time, we verified that the low-latency kernel is characterized by larger average latencies respect to the preemptable and lock-breaking preemptable kernels, but reduces the worst case latencies. In other words, the tail of the probability distribution function is shorter for a low-latency kernel. 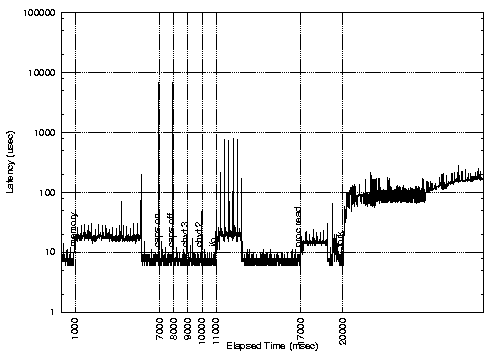 As an example, the PDFs of the latency during the I/O stress are reported in the following figures (note that this new experiments were performed on a computer that is faster than the one used for the previous experiments). According to the previous figures, it seems that the low-latency patch provides better real-time performance. This is probably due to the fact that the Linux kernel still contains ``big spinlocks'' that are held for long amounts of time, and that the lock-breaking patch does not ``break'' properly. A classical example is the spinlock used to serialize BHs. However, in the future Linux developers will likely decrease the size of kernel critical sections (to improve SMP performance), hence it seems to be reasonable to think that the latency of the preemptable and lock-breaking preemptable kernel will decrease.